A cautionary pop fable following the meteoritic rise of "The Wonders," a fictitious foursome during the early days of pop-rock fandom. When jazz drummer Guy Patterson fills in for a session with a friend's band, a hit single is born and the smalltown boys find themselves riding a rollercoaster of success, guided by the opportunistic hand of a smooth-talking record label agent. Fun, cheerful, and innocent and Tom Hanks' directorial debut. $6.208 million on 1870 screens. Tom Hanks: Renaissance man? While he hasn’t earned that lofty title just yet, in 1996 he made one big step toward becoming a triple threat. Through a long series of hit films, Hanks long ago established himself as one of the most successful actors of all-time. He won Oscars for Philadelphia and Forrest Gump and also starred in many huge successes. 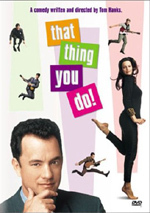 Not content to simply star in vehicles created by others, Hanks stepped behind the camera for 1996’s That Thing You Do!. Although he also performed in a small role, Hanks’ main contributions to the piece were as its director and writer. Unfortunately, the movie underperformed at the box office, so it gets lost in the Hanks shuffle. However, this doesn’t mean that it’s not a fine film. Despite its relative anonymity, That Thing You Do! provides a terrific experience filled with charm, humor and fun. The movie takes place in Erie, Pennsylvania in 1964. 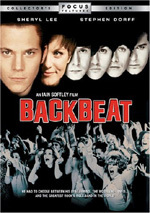 In his early twenties, Guy Patterson (Tom Everett Scott) works at his Dad’s appliance store and he drums along with jazz records for fun. He’s never played in a serious band, but some friends recruit him to perform at a college talent show when their drummer breaks his arm. As such, Guy quickly joins the “One-ders” - singer/songwriter/rhythm guitarist Jimmy (Jonathon Schaech), lead guitarist Lenny (Steve Zahn), and The Bass Player (Ethan Embry) - and a quick run-through of their showcase song - “That Thing You Do” - shows that he has the chops to replace injured Chad (Giovanni Ribisi). Actually, he more than fills Chad’s shoes. Guy’s a vastly superior drummer, and when his enthusiasm gets the best of him at the talent show, he transforms the ballad into a peppy pop tune, all to the delight of the crowd. The One-ders easily win the contest and their stars begin to rise. They get a gig at a pizza shop, which leads them to record a self-produced single, which interests a manager (Chris Ellis) who gets them on the radio. Not long after that, a real record label comes a-calling, and after A&R man Mr. White (Hanks) signs the band, soon the One-ders - mercifully renamed the Wonders - are on the fast track to become a nationally-famous act. As implied in the name of the band, the film is a generous nod to the legions of one-hit wonders who’ve appeared over the years, so it’s virtually inevitable that fortunes will eventually sour for the Wonders. Nonetheless, the movie follows their path to brief fame with affection and glee, and it all creates a charming and entertaining experience. First of all, I’ll get some minor complaints out of the way. The movie’s main flaw is that it sputters during its second half. Once the Wonders achieve real success, the story becomes less interesting, especially because the cracks start to show. Jimmy always was the temperamental talent behind the band, and he views himself in an increasingly serious manner with inevitable negative repercussions for the group. 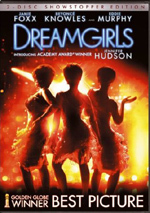 Most of the movie’s second half takes place during the band’s trip to Los Angeles. There they perform a variety of promotional duties while Jimmy whines about his desire to cut new songs. These segments still work, but they lack the spark of the film’s first 50 minutes or so. The story largely wastes Charlize Theron in a thankless and fairly unnecessary role. She plays Tina, Guy’s girlfriend in Erie. A prim and uptight throwback to the Fifties, Tina and Guy always seem wrong for each other, and her departure from the scene feels inevitable. Much of the movie leads to a union between Guy and Jimmy’s girlfriend Faye (Liv Tyler), and I’m not sure why we needed to see Tina. I guess Hanks felt Guy needed to have some signs of romantic life before he connects with Faye, and Tina also provides a shorthand look at why Faye’s so terrific. Through their visual styles, Tina represents the stiff and stodgy Fifties while Faye looks ahead to the wild and loose Sixties. Still, I think Tina serves little purpose and doesn’t really add anything to the film. I also feel that Hanks got a little cutesy at times with some references. The frequent mispronunciations of the “One-ders” - always called the “O-need-ers” - get a little stale, though a couple of fun gags revolve around them. The lack of a name for the bass player is a minor tip of the cap to the often-anonymous nature of these performers. Bassists tend to be quieter and recede to the background more than other instrumentalists, which is why Hanks fails to give a moniker to this character. That’s a little too precious for my liking. However, these are minor quibbles that do little to detract from a fabulous film. I wasn’t alive during this area, so I can only speculate about the movie’s accuracy, but I do know that it all feels right. Hanks captures the innocence and charm of the period with spark and excitement, and he especially relates the thrill of being in a band. The early segments in which the group starts to coalesce and hit a groove are as thrilling as anything in an action film. This may sound silly, but when the One-ders launch into that talent show rendition of the song, I get goose bumps. I can sense the life and vitality that would course through such a situation, and it makes me nearly giddy to watch it. The film supplies other instances of similar emotions. When the single first gets played on the radio, Hanks stages this in an ingenious manner, whereby Faye hears it initially and then alerts all the others through screaming and dial-turning. The simple joy and glee seen in these kinds of sequences was absolutely charming and delightful, and Thing piles on many of these moments. Having never been in any band - much less a successful one - I can’t really judge the accuracy with which Hanks depicts these events, but it all seems quite true to life. It must be a tremendous thrill to go through the various stages seen in the movie, and Hanks portrays all of them with a wonderful honesty. There’s nothing cynical or ironic about the movie, as it always seems nicely genuine and affectionate. Some have criticized Thing for its softness, especially as it relates to Hanks’ Mr. White. They felt that character should have been nastier and more ruthless in his exploitation of the Wonders because of the heartless nature of the music business, and some thought that Hanks was unwilling to do this because he didn’t want to sully his “nice guy” reputation. That may well be the truth, but this neglects one important reason why Mr. White should receive a generally positive portrayal: Thing isn’t a documentary portrayal of the record industry. It’s meant to be a loving nod to the fun and peppy side of the biz. The fact it takes place decades in the past makes it easier to portray the innocence of the experience, but even if it were set in the present, I’d still think it’d be done best with a similar positivity. This isn’t a movie that wants to revel in the dark side; it just wants to show how much fun it can be to be in a band and have a hit. Frankly, I think that the movie probably makes Jimmy too nasty a character. He’s always rather sullen and self-absorbed, but the manner in which he turns on Faye toward the end seems to be unnecessarily cruel. Granted, this has to happen to ensure that the audience will accept the eventual Guy/Faye union, but I would prefer a less-negative portrayal of Jimmy. All of the other band members are allowed to leave the audience fond of them, so it’s a shame he has to be the baddie. Nonetheless, I genuinely love That Thing You Do!. It’s not a flawless piece of filmmaking, but it’s often bright, funny, charming and delightful. The movie maintains humor, innocence, romance and glee at high levels and manages to do so without any tawdry or mean-spirited elements. If this is an indication of his talents, as far as I’m concerned, Tom Hanks is permitted behind the camera any time he wants. That Thing You Do! appears in an aspect ratio of approximately 1.85:1 on this single-sided, dual-layered DVD; the image has been enhanced for 16X9 televisions. A lot of problems cropped up during this flawed presentation. Sharpness caused some major concerns. During quite a lot of the movie, the image seemed rather soft and fuzzy. These issues weren’t consistent, though they appeared more frequently during interiors. Nonetheless, softness could crop up for no apparent reason, and much of the flick seemed hazy and ill-defined. Some portions appeared appropriately crisp and accurate, but the frequent softness really detracted from the presentation. No moiré effects or jagged edges marred the image, but a surprising number of print flaws appeared. Some low-light situations showed grain, and a variety of specks and grit showed up throughout the movie. On the whole, the picture really looked clean for the most part, but I felt that the preponderance of defects seemed somewhat heavy for a modern film. Colors generally appeared accurate and solid, especially as the band climbs the ladder of success. I saw a nice variety of hues through their stage clothes and the other pop outfits of the time; mid-Sixties music lent itself to bright, bold tones, and the DVD replicated these fairly well. As a whole, I felt the colors could have been more vivid, and they occasionally seemed a little drab, but I had no real complaints in that area. Black levels appeared similarly decent but unspectacular. The dark tones generally looked fairly deep and dense, but they lacked great intensity and could seem slightly bland. Shadow detail was acceptably clear and defined, though the grain that accompanied some of these scenes made them less appealing. This was a weak transfer that only merited a “D+”. Much more satisfying was the Dolby Digital 5.0 soundtrack of That Thing You Do!. Those who expect a killer soundfield will likely come away disappointed, but I felt that the mix worked quite well for this kind of film. Not surprisingly, music dominated the piece, as the umpteen renditions of “That Thing You Do” and a variety of other tunes provided fine imaging. The forward channels showed excellent stereo definition for the music, and the surrounds kicked in nicely to add ambience; I didn’t detect many examples of unique instrumentation from the rears, but they provided a solid level of atmosphere to the songs that made them all the more effective. Most speech resided in the center channel, though a couple of lines cropped up from the sides. As for the effects, they generally maintained a fairly subdued atmosphere that sounded natural and convincing. I heard modest panning when appropriate; for example, cars might travel accurately from one side to another. A couple of sequences also showed good surround usage, such as the sound of a plane that passed overhead; this and a few other bits reminded us that all five channels did contribute some audio other than music. While this wasn’t a stunning soundfield, it seemed very appropriate and natural for this film. Audio quality also appeared strong. Dialogue was warm and natural, and lines lacked any signs of edginess or intelligibility; all of the speech was real and distinct. Effects were generally the least important aspect of the mix, but they seemed clear and accurate, and they showed no distortion or other flaws. There was little dynamic range to be heard from the effects just because they mainly stayed in the background, but I felt that the track cleanly replicated these elements. Best of the bunch was the music, which sounded quite terrific. I should have tired of the title tune since they play it about 7000 times, but the fine audio quality kept it fresh. “That Thing You Do” and the other musical facets of the track appeared lively and rich as all of the instruments and vocals came across as clearly-defined and smooth. Low-end seemed quite strong, as bass and drums packed a nice depth and tautness throughout the movie. I was impressed by the attention to detail; when the folk-singing women play the talent show, we see a microphone get moved closer to the acoustic bass, and the volume level of that instrument rose appropriately. All in all, you won’t trot out That Thing You Do! to showcase your home theater, but the soundtrack provided a consistently solid and satisfying auditory experience that nicely complemented the movie. The DVD falters more severely when we examine its supplements. Though there’s enough here to keep it from “bare bones” status, the platter is far from being a special edition, and the extras are fairly sparse. The main attraction is a 13-minute featurette about the film. Hosted by former VJ Martha Quinn, this program offers the usual mix of film clips, shots from the set, and interviews with principals. In the latter category, Hanks dominates, but we also hear from producer Gary Goetzman and actors Tom Everett Scott, Jonathon Schaech, Steve Zahn, Ethan Embry and Liv Tyler. The program rarely rises above the level of promotional puff piece, but it had some moments of fun. It was good to see the material from the set, and while the interviews weren’t terribly illuminating, I appreciated the joy with which Hanks discussed the material. It’s a minor show but it was pleasant to watch. Next are two music videos. We get clips for “That Thing You Do” and “Dance With Me Tonight”. Presented in a 1.85:1 aspect ratio without anamorphic enhancement, “Dance” is pretty much useless. It’s actually a slightly shorter cut of the track that appears in Chapter 16. Since the video looks fuzzy and doesn’t offer the same excellent 5.0 sound as the movie itself, there’s no reason to watch this clip instead of the appropriate scene in the flick. As for “Thing”, it’s actually something of a deleted scene. The Wonders play the song at the same Illinois show from which “Dance” comes. However, no remnants of this segment remain in the finished film. I’d guess that Hanks tried that part of the flick with “Dance” or “Thing” and decided that since we hear the former five million times in the movie, he might as well spice things up with a new tune, and that was a good decision. This version of “Thing” nicely demonstrates the band’s increasing professionalism, but the change was useful. Anyway, despite the fuzzy video quality, it’s a nice little addition to the DVD. In addition, we find a slew of advertisements. There are six TV spots on the disc plus six trailers. Two of these are in English while two are in Spanish and two are in Italian. The latter are interesting because the lines have been dubbed into the native language, while the Spanish ones feature narration in that language but simply subtitle the dialogue. As for the English clips, they’re notable mainly because they show some brief snippets from deleted scenes. There’s a lot to like about That Thing You Do!. The movie itself is a nearly unmitigated joy as it provides a fun and happy experience from start to end. It captures the positive side of being in a band without any cynicism or mean-spiritedness, and it lets us join a bunch of good guys as they make a brief run at the top. It’s a smart, happy piece that I genuinely enjoyed. The DVD features flawed picture and only minor extras, though at least the audio sounded good. I love the movie and think it deserves a look, but this is a problematic disc, mostly due to its weak visual quality. To rate this film visit the Director's Cut review of THAT THING YOU DO!